How can I efficiently build a deck from a box of random cards? Recently I've become interested in playing Magic The Gathering. 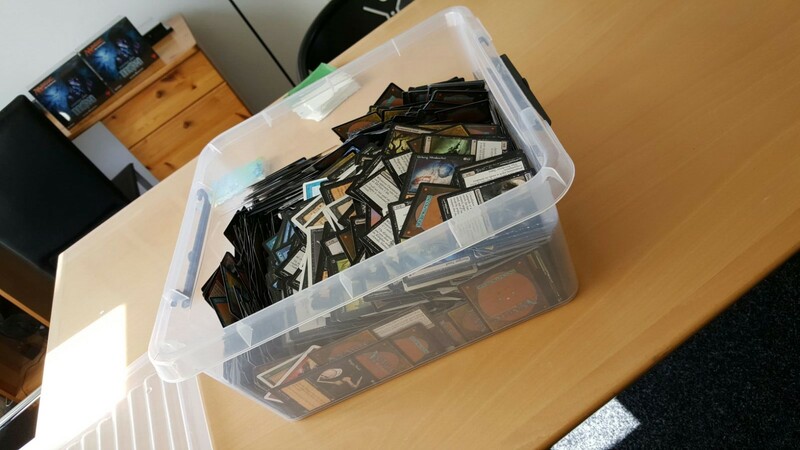 One of my friends, a long time player of the game, has offered me a large box with many random cards in it. He says I'm free to take whatever I like. I know what colors I enjoy playing, so I've begun digging through hundreds of cards and keeping aside the cards that seem good to me. I'm a real beginner, and although I know how to play, it's hard for me to know which cards are good and which are bad. Some of the good cards hide their strength in subtle ways to use those cards; it's not always blatantly obvious how strong a card really is (to a beginner like me). After taking something like 120 cards from the box in the colors I liked, I set out to make a deck from it. But it dawned on my I actually have no clue how to build a deck with completely random cards. I know a deck needs to be at least 60 cards, and you are not allowed to have more than half your deck in Land cards. I know the very basics of deckbuilding, but usually you start with cards from the same series that are already having some kind of synergy. How can I efficiently build a deck from a box of completely random cards, spanning series from as old as 1994 to recent modern cards of 2015 and 2016? This question is prone to receive a lot of subjective answers, so I'm looking for an answer that is complete, is written from experience rather than opinion and backs up opinion with facts or references. This part is the most time consuming, as I don't recognize any of the cards and I need to read what the card does, then understand if it fits my style of play. The only 'quick filter' I had was looking only at cards that matched my desired colors. How do I speed up the process of finding cards that fit my play style from a box of random cards? Then I placed the cards in front of me on a table, grouped by mana curve and separated by creature cards and spells. This resulted in two rows per color, each column increasing the converted mana cost. To speed up this process, I first split my stack into new stacks per color. Then, one color at a time, I built up the rows and columns. Now that I have a good idea of the cards I collected, I can pick the right mix of creatures and spells with a good mana cost distribution. This is the fun part of deckbuilding, and also the part I don't feel I need help with. It's also highly subjective. If you're willing to spend a bit of time up front, you can probably "triage" the cards in a way that might make deck building easier. Grab a large section of cards and sort out the colors you are interested in. Sort the cards within the colors by the set symbol. The idea here is that you're more likely to get interesting synergies from cards that are from the same set. Choose the sets that have the most cards in them, and sort those into lands, creatures, and non-creatures. If there are still too many cards, you might sort the creatures into ones that share a keyword or troop type. Now you can start your deckbuilding. Start with creatures and add ones that look interesting until you have about 25 creatures. Then go to the non-creatures piles for the sets you used, and find 10-12 that go well with the set of creatures you chose, swapping as necessary. This way you aren't having to read every card, and you're more likely to end up with a deck with at least some interesting interactions. It isn't going to win a tournament, but it will let you get started, and then you can read more cards as you have time and continue tweaking your deck. Since you have no prior knowledge about the cards you got, and they are from practically all possible sets of Magic since its first release, your card pool will be wildly inconsistent, and synergies between cards will be incidental, if they exist at all. A veteran player can sift through such a pool relatively quickly because he or she would already be familiar with the cards, and recognize good and bad cards from the artwork and/or name alone. As you describe it, you don't have that option, so reading and evaluating all of the cards' properties such as mana cost, abilities, and power/toughness seems to be your only option. You could consider it an opportunity to expand your card knowledge. From experience, a gifted random pool such as yours consists mostly of commons, uncommons, and the occasional junk rare (Note, however: When cards go bad, an article about bad rares that I highly recommend). That means, of the archetypes described in the article you linked, Control and especially Combo are outside of your reach. Pure Aggro seems hard as well, because it works only with the most efficient, specialized cards in multiple copies, which your pool is unlikely to provide. That leaves Aggro Control for the archetype you can most likely build with any success. In a nutshell, you want a mix of efficient creatures to actually win the game, and control cards such as creature, artifact, and enchantment removal to allow your creatures to get through. such as a 2/2 for 2. Additional stats or beneficial abilities mean the creature is above average efficient and worth considering for inclusion. An efficient spell is one that does what it does cheaply for a tempo advantage, or that gives you card advantage, such as destroying 2 or more permanents for one. Once you have identified all the possible cards for such a deck, you can proceed to get the right mix of creatures and spells, adjust the mana curve, playtest, and so on. This is going to feel a lot like going to a Pre-release blindly. Excpet that you want to end up with a 60 card deck (usually 40% lands, so 36 cards, 24 lands). Sort the cards by Color. Find your "Bombs" for each color, and separate them from the rest. These will be cards that win the game quickly upon being played (Think Dragons, Demons, Angels, etc.). These are the cards that will actually win games for you (in low level play). The rest of your deck serves to support these bombs. Find your "Removal" for each color, and separate them as well. These will be, depending on the color, Counterspells, Kill Spells, burn spells, enchantments, or anything else that effectively negates your opponents creatures and/or other win conditions. These will serve to kill your opponents "Bombs", keep you alive long enough for yours to get the job done, and clear the way for your threats. Build a "Curve" from the remaining creatures. That is, try to pick out the most efficient/powerful 3-4 creatures at each mana cost (ie, your best one mana creatures, then the best 2 mana creatures, etc), starting at one, and going up to within one or two of the mana cost of the "Bombs" you picked out in step 1. From the remaining cards, pick a few from each color that interest you personally. Something that has a cool sounding effect, or even just art you like. At this point, you should notice that the piles for some of your colors are bigger than others. Start with the biggest pile(s). Take the 4-5 best "bombs" from that pile, and then start filling in 4-5 cards per mana cost up to the cost of your bombs (they should be the most expensive cards in your deck). Try to work at least 4-5 of your removal cards in among the creatures. Finally, add 2-3 of the interesting cards from step 6. At this point, you should have selected around 36 cards for your deck. Add 24 lands, shuffle, and play a few games to see how it works out. Not the answer you're looking for? Browse other questions tagged magic-the-gathering deck-building or ask your own question. How can I improve my deck building skills? How to build / ideas for a multiplayer lifegain control deck? How to build MtG duel decks out of a set of older cards? How can I find a FNM-competitive affordable deck? How likely is it to get a complete set of commons from a single booster box?